GUEST ARTICLE: At the start of The Road we realise that some unnamed event has rendered the earth uninhabitable. No plants or animals are left, the earth is growing colder and grayer each day, and the few people who remain alive are scavenging for food that can still be found. The film traces the journey of Viggo Mortensen as a father and (amazing newcomer) Kodi Smit-McPhee as his son, born after the unnamed event, and so never knowing the world as a beautiful, hospitable place. At the wish of Charlize Theron, the boy’s mother, who we see in various flashbacks throughout the film, they are heading for the coast, while heading south, trying to escape the too cold winters. There are only a couple of other speaking roles of note in the film – Robert Duvall plays an old man who is somehow still staying alive in this bleak world, and Guy Pearce plays another wondering father. Before we proceed any further, it’s worth pointing out that all the acting in the film is excellent. The relationship between father and son really works, and somehow the boy manages to be compelling but not irritating (except, perhaps, when his character is being genuinely irritating). 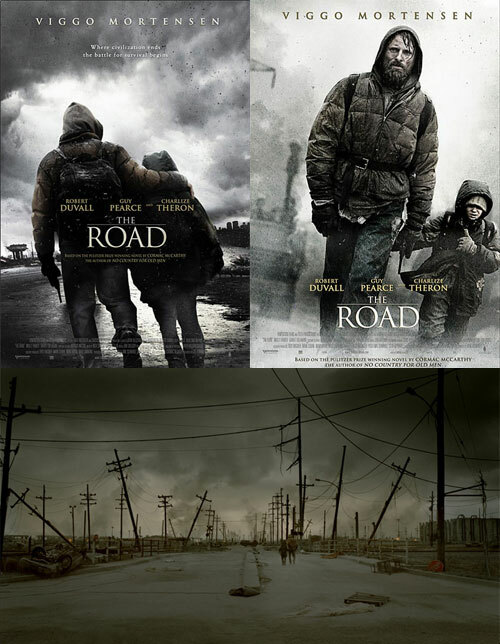 The Road is based on a 2006 Novel of the same name by Cormac Macarthy (author of “No Country for Old Men” and “Blood Meridian“). I haven’t had the chance to read it, but Roger Ebert when reviewing the film considered the book to be better, to the detriment of the film. Mood-wise, the film is incredibly bleak. The colours on screen are desaturated, and CGI has been used to tone down the skies, to make the odd situation of the world work better. The two main characters spend most of the film looking impoverished and starving, trudging along on their journey while transporting their possessions in either a shopping trolley or a cart. Having said that, there are moments that are bright and uplifting (usually followed by things getting much worse). Some scenes of genuine tension are present, and you wonder how father and son will escape, and what will become of some of the other unfortunates! With such a dystopian world, it’s not surprising that the theme of suicide is prevalent, though you may find it uncomfortable just how much such a loving father can talk to his son about it. Another issue presented is cannibalism, with some of the more gory scenes in the film presenting how this might be integrated into the life of a surviving group. The big issue, though, is one of redefining morality in the absence of law and order. Father and son discuss the notion of still being “the good guys” despite terrible events unfurling, and “carrying the fire” as they continue to struggle searching for food. If you’re a parent, you will be asking yourself what you would do in that situation – how much would you do for your own child? The film is not without its flaws: as much as the viewer might try to forget Viggo Mortensen’s past roles, there’s a scene where he is sliding a ring along a handrail towards the edge of a sheer drop, which I found brought me out of the flow of the film. Perhaps the greatest flaw in the film is the ending, but I’m trying not to provide any spoilers, so I will say no more. The general flow of a Hollywood-friendly apocalyptic film (e.g. 28 Days Later, Independence Day, The Matrix, War of the Worlds) is a focus on the events that are damaging the world, choosing some characters who must overcome adversity, and following their journey until the inevitable righting of the world-damaging events. The Road doesn’t follow this trajectory, choosing instead to concentrate on the relationship with the father and son. For this reason alone, it’s worth adding it to the list of apocalyptic movies you’ve seen. If you worry about such things, it scored 76% on Rotten Tomatoes and 64% on Metacritic. This guest article has been written by my friend David Phillips (@cafedave on Twitter). David is a Digital Marketing Manager at the University of Technology Sydney. So… I saw this at the weekend, and to be honest I felt a bit disappointed. I’ve not read the book either, but felt like there was a huge amount missing from the film. It wasn’t all bad: The acting was pretty solid throughout (although Theron was a little bit.. unlikely), the photography was suitably bleak, the script suitably sparse, and a bit part for Michael K. Williams (Omar in ‘The Wire’) was a highlight. But some of it was: Books (for me) can focus on a really tight narrative – what’s happening, to whom, why, how, but films can’t get away with that. If you paint a dystopian future, people notice every detail and, will ask questions which they wouldn’t think of in a book. I still think there’s enough meritworthy in here to get this out on DVD (I think you’ve missed it at the cinema), but maybe it’s that rare case where you have to have read the book to appreciate the film? Why no cockroaches – they famously survive everything? why no rodents (no mammals at all except for humans and one dog)? why no ships ? why no hydroelectric ? I thought there were enough pieces joining together the larger set pieces that it worked as a larger journey, though you’re right, there was a sense of distilling it down into the pieces that would best be filmed. Theron does seem an odd pairing with Viggo in this, but I thought their screen relationship seemed convincing enough. I think the popular thinking is that cockroaches would survive a nuclear holocaust: there’s not really the suggestion that this happened, just that everything started to fall apart. Hydroelectric is a better question, but I suspect this falls into the category of suspending disbelief. Perhaps with no viable food supply the people maintaining the equipment lost interest in it? “the cockroach is, at least in terms of nuclear survivability, a wimp. The two Drs. Wharton had found in 1957 that it took only 1,000 rads to interfere with cockroach fertility. In 1963, Drs. Ross and Cochran found that a dose as low as 6.400 rads would kill 93% of immature German cockroaches – making cockroaches only six to fifteen times tougher than we frail humans. Sure, cockroaches survive radiation better than we do – but they curl up and die at doses than don’t even bother other insects”. I was really just suggesting that I can’t think of a single series of events that would make the only survivors humans, one beetle and one dog. Almost any other combination of species would be more plausible. I thoroughly enjoyed this film for the raw emotion and the “what would I do?” moments of self-reflection it forces upon the viewer. As Dave suggests, suspend disbelief and don’t over-analyse – just sit back and soak up the depressive atmosphere.